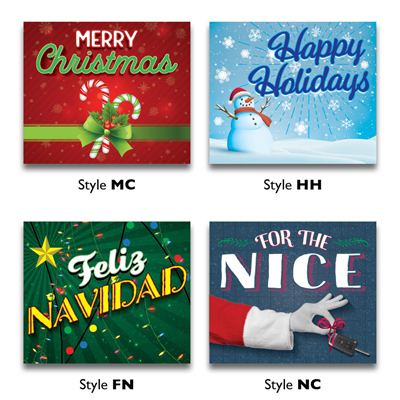 Show your customers the holiday spirit with these Clip-On Car Flags. Great for vehicles with retractable antennas or if you are concerned about damaging any antennas. Made of polyester cloth, each flag is 11 inches tall x 13 inches wide and sewn on a white sleeve which is attached to a 20 inches tall durable white plastic staff with molded clip. 7 designs to select from above. The item being sold is one package of 6 flags.